Apparently it’s one of those streaks when the euro simply refuses to fulfill basic expectations, as today prices declines a little over 100 pips, wiping out all of its gains from the day before. I’ve updated the hourly chart to reflect a new count, but please do treat it tentatively for the time being. We need to see a clear 5-wave movement toward the downside before we can have confidence in this new count. Price should move lower to reach between 1.1311 and 1.1279, while remaining ideally below 1.1447. Elliott Wave chart analysis for the EURUSD for 21st March, 2019. Please click on the charts below to enlarge. Blue wave 2 may be forming a zigzag or a flat labeled pink waves a, b and c.
This count expects the euro to continue moving toward the upside in blue wave 2. At 1.1419 blue wave 2 would retrace 61.8% of blue wave 1, then at 1.1485 it would retrace 78.6% of its length. This wave count would be invalidated by movement above 1.1569 as blue wave 2 may not move beyond the start of blue wave 1. It’s also very likely to be invalidated by movement below 1.1175. This main hourly count sees that blue wave 2 is likely forming a flat labeled pink waves a, b and c.
Pink wave a likely formed a zigzag labeled green waves (a), (b) and (c). Pink wave b is likely also forming a zigzag labeled green waves (a), (b) and (c). Green wave (a) appears to be forming an impulse labeled orange waves i through v.
This count expects the euro to continue moving generally toward the downside in pink wave b. This would be confirmed by movement above 1.1335. 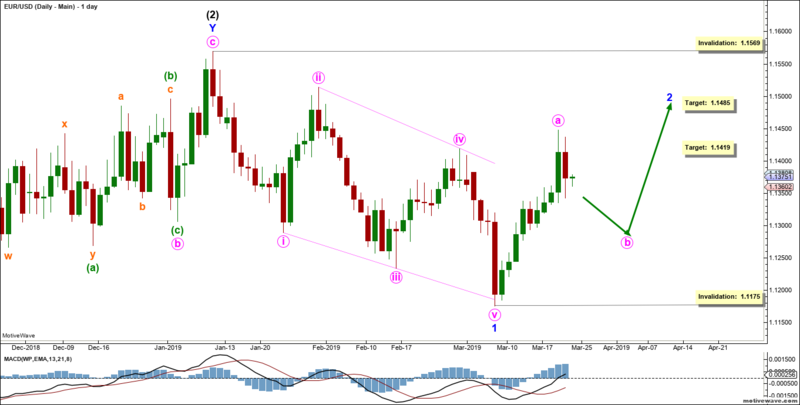 At 1.1311 pink wave b would retrace 50% of pink wave a, then at 1.1279 it would retrace 61.8% of its length. 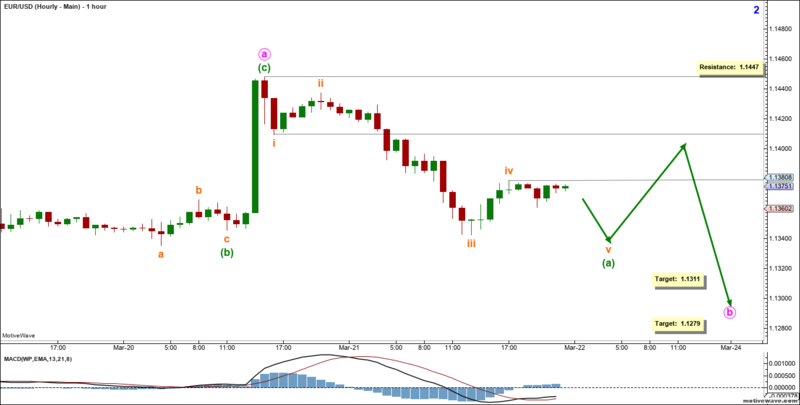 These are just early targets, and once the count has been confirmed, the actual target of the flat will be published. This wave count would be largely (but not conclusively) invalidated by movement above 1.1447.